Wondering how entry-level models from Mercedes-Benz vs. Audi compare? A good place to start is the Mercedes-Benz CLA vs. Audi A3! The Audi A3 Sedan offers a peppy turbocharged engine with good fuel economy and a cabin full of features. Then again, so does the Mercedes-Benz CLA Coupe—and you’ll get more power for your money. Compare the new Mercedes-Benz CLA vs. Audi A3 in more depth below! The Mercedes-Benz CLA Coupe and Audi A3 Sedan are both powered by 2.0L turbo inline-4 engines. Their specs aren’t equal, though. 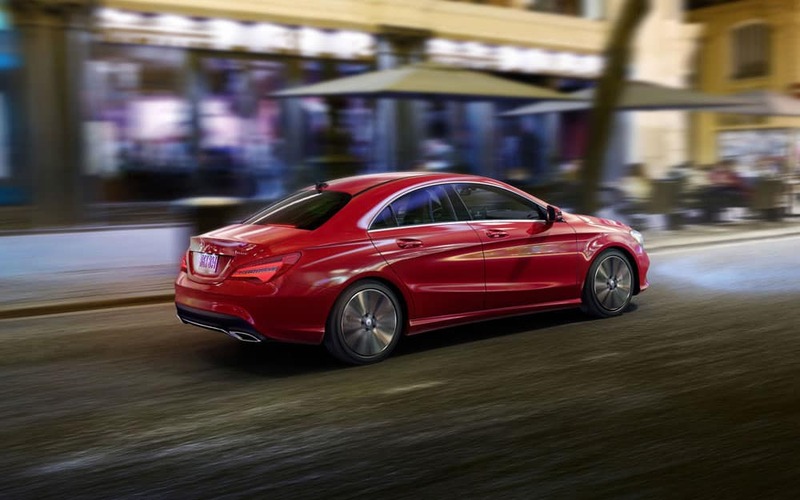 The CLA 250 manages to coax more power from its engine—up to 208 hp and 258 lb-ft of torque. The Audi A3 2.0T Premium produces just 186 hp and 221 lb-ft of torque. Speed-wise, both vehicles are comparable; the CLA and Audi A3 reach a top track speed of around 130 mph. In a CLA vs. Audi A3 comparison, mpg ratings are somewhat similar, but there are some notable differences. The 2018 Mercedes-Benz CLA earns an 24 mpg city/37 mpg highway. On the other hand, the 2018 Audi A3 earns 26 mpg city/35 mpg highway. When it comes to fuel conservation, the A3 is better suited for the busy streets of Chicago, while the CLA does better in areas with more open stretches of road like Oak Park. Front-Seat Memory Settings: The front seats include a 14-way power adjustment and can store up to three positions for the seat and power side mirrors. Large Trunk Capacity: The CLA offers 13.1 cubic feet of storage in the trunk; you’ll get up to 12.3 cubic feet with the Audi A3. Optional Authentic Wood Trim: The CLA can be had with a variety of wood interior trims, such as Burl Walnut or Matte Black Ash. Find a New 2018 CLA Coupe at Mercedes-Benz of Chicago! When you compare the Mercedes-Benz CLA vs. Audi A3, it’s easy to see that the CLA offers greater power, more highway efficiency, and extras like optional wood trim. Test drive a new CLA Coupe at Mercedes-Benz of Chicago, located near Evanston. Don’t forget to take a look at our latest CLA lease specials!